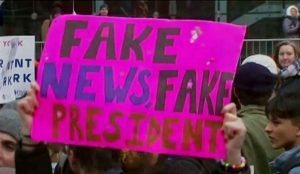 The constant protests by the Entertainment industry against Trump will not subside. There is only one way this is going to end and that is blood in the streets. The riots will only escalate and the left ALWAYS becomes violent. They would not even allow the education secretary to enter a school. 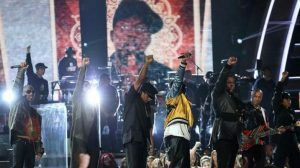 The Grammy show was reduced to hurried political statements, A Tribe Called Quest delivered a vigorous rebuke of Trump during a tribute to Phife Dawg, who died in March 2016. The group said the performance of We the People was also in honor of protesters. All of this is building to violence. Then the police will respond and then the outcries will be see – Trump is running a police state. This will only tear the country apart. Many of these protesters are not old enough to even vote. Their teachers allow them to cut class to protest against Trump. When asked what they are protesting about, they do not even understand the issues. This is like a rumor mill. By the time it gets to the 5th person, it is nothing like what was said. You have black students in high school repeating Trump said all blacks are ignorant. Others saying Iraq is not a terrorist nation because they never heard of that. Still others said people should come in and not even be checked. This is the mindset that is sweeping the nation and it is really scary. This is part of the cycle of civil unrest and indeed it looks like the computer is going to be right once again. This will be the BIGGEST spike in civil unrest in American history, It is already the biggest with regard to trying to block and overthrow the Trump Administration and Obama, Nancy Pelosi, and Chuck Schummer are all encouraging this violence. Nancy Pelosi says she cannot work with Trump at all and she is the head of the Democrats. This will ONLY end in bloodshed.